TVK Miscellaneous #50 : WHO built WHAT for WHOM ? WHO built WHAT for WHOM ? Note : this is a preliminary text, More info is at hand but not yet "digested" and, also, since TVK is under complete reshaping, the full-size text will be augmented within the new interface and iconography. Bar a couple of outfits like Victor, Matsushita or Mistubishi, most brands which launched audio programs after WWII were little organizations : Denon was barely formed out of Columbia and several other even smaller manufacturers/distributors, Sony only had 483 employees in 1951 and Onkyo or Luxman were tiny local minors (and remain so to this day). The post-war and economic boom allowed many "startups" and factories to be set up to feed the ever increasing number of people with the newly available electrical appliances : TVs, radios, ovens, musical instruments and... high-fidelity. Parallel to this was Japan's ambitious university program which fed newly formed brands and older ones with young and highly skilled engineers. University and industry worked hand in hand and since there was so many possible jobs to apply for, "mobility" was high. Think that, for instance, Sanyo was established by Toshio Inoue in 1947 and Inoue was the very brother-in-law of Konosuke... Matsushita ! Like England, Japan is an island which means that, rather quickly, everybody knew everybody. And "everybody" means more than the few majors and minors we all remember such as Sony, Kenwood or Pioneer : there were a thousand and one contractors and sub-contractors with their own factories. Coming to mind are somewhat well known ones such as Tatung in (south) Corea or Shin Shirasuna, Inkel, Marubeni and Funai in Japan. But there were a thousand more of such hardware providers which "majors" could rely onto if this or that part of a planned product wasn't available in their own factories. Such parts may have been a special motor, a special way to make PCBs or to extrude aluminium. All we'd see in the end is "brand X" - but there often were many people / factories / providers / sub-contractors involved. Micro Seiki worked on many turntables (Luxman, Nakamichi, Onkyo, Kenwood etc) and probably relied, at times, on Mr Teragaki, independent engineer, for this or that problem to be solved. Between the mid 70s and mid 1980s, a yearly catalog was published which showed ALL the products made by every registered electric/electronic company in Japan and Asia at large. These catalogs displayed designs from the "majors" and the barely different equivalents built by said contractors or sub-contractors. Equivalents here doesn't mean Shin Shirasuna copied the H/K products but that the H/K products were made by the Shin Shirasuna Company. The mixing of which gave the SILVER components which were H/K products in disguise - and Shin Shirasuna products from top to bottom. Browsing through 1970s Stereo Sound or Audio Accessory issues, one can see the astounding myriad of little brands, parts suppliers and, sometimes, even lookalikes that were probably made by said (sub-) contractors in an attempt at cashing in directly from what they actually did produce for well-known brand X or Z. Unfortunately, said catalogs are now part of the Invisibilia and no copies are known to have survived this side of the world. However, there is a way to retrace some of those exchanges of manufacturing services ! It is limited and one has to scout local units made only for the japanese market. But with infinite and minutious patience it is a good way (the only one anyway) to really see who built what, for whom, and where. This way takes the shape of the back-plate of the vast majority of japanese audio components : it sports a little logo shaped as a circled "T", the top bar of the T being doubled up - like an "earthing" logo upside down. Next to this logo is written the name or logo or abbreviated tag of the actual manufacturer. Said T logo is present only on units distributed in Asia : it never was and still isn't present on any export unit. The result is that one has to scout japanese websites for... backplate views ! Since this is a preliminary text, I will at first only deal with the most befffuddllinng brand of all : LUXMAN. Founded in 1925 in Osaka, LUX was after WWII a small brand : in fact, it was a specialized shop within a department store. Luxman until the early 1950s, like others, benefitted from the launch of radio and the receivers necessary to actually listen to the new medium. 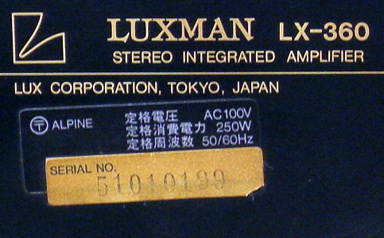 In 1952, now a fully independent brand, registered as LUX Corporation of Japan, still in Osaka, Luxman started the production of its famed OY transformers and, after the 45/45 stereo LP appeared, really branched in into the burgeoning high-fidelity market. The MA-7A monoblock power amp with (global) NFB came in 1958, followed by the well remembered SQ-5A integrated amp (1961), the not-so-well remembered SQ-65 (1962, with MFB - Motional FeedBack !) and the SQ-38D & WZ-30 masterpieces in 1964. The rest was a breeze and Luxman grew larger and larger, launching two sub-brand along the way (LuxKit and L&G) and even doing rebadges for others (BIC). By the late 1970s, however, Luxman's traditional and unbelievably complex manufacturing schemes and ever increasing multiplication of (often useless) versions must have weighed on the brand's yearly profit. 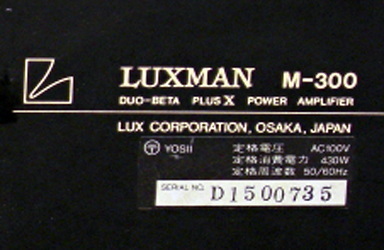 Luxman seemingly made a point of doubling up its Luxman-branded units within the LuxKit brand, often adding slightly different siblings along the way, making all of these somewhat different for the export versions or even naming completely differently the fifth version of this or that popular amplifier : product planning pushed to the limit, the expensive limit. Several factories were involved, either owned by Luxman in Osaka or others doing intermittent duties for Luxman here and there in Japan. 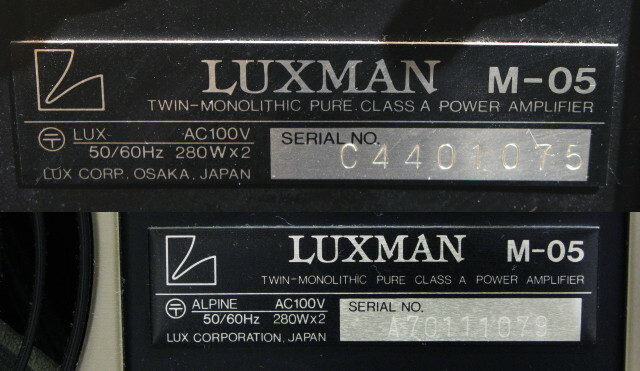 Some units were "manufactured by Luxman Corp., Japan", some were "customed by Lux Corporation", some by Lux Corp., some were a mix of this and some were again something else - not to mention the numerous LuxKit variations. If these slight name differences may seem trifle, they nevertheless depict a different corporate structure and registered identity : LUX Corp. (pre c. 1978) isn't the same as Luxman Corporation of Japan (post c. 1978). The same applies to "customed by..." and "manufactured by..." for "customed" can be understood in different manners : either "modded" or "made especially for". The PD-131 for instance was "customed by LUX Corporation" - natural since it was built withMicro Seiki parts and assembled / modded by Lux. Most Lux serial numbers start with a letter (not always...), then a 4-digit code, then the real serial number ; this was carried into the Alpine era and up to today (for example : A20710373 or G40701089). Starting with the Alpine era, the letter represents the source factory/maker. I guess that, as for Sony, the real total production run of a given unit must result from the addition of all serials (last 3 or 4 digits) within all 4-digit codes (A20710373 + A21710373 + A30710373 etc) but I have yet to be sure of this. Often seen during the mid to late 1970s are "SONIC" (tuners such as the T-40A) or "LCJ" (Luxman Corporation of Japan, for amplifiers such as the CL-40 or the rare L-11) tags - but not on all units and not always. "YOSII" is another tag found, for instance, on the L58A and L-48A (1980), L-48X (1981), successful L-430 series (1982) or the T40X tuner. YOSII appears circa 1977 and vanishes when the Alpine era begins. Turntables like the PD444, PD441, PD555 and VS pumps generally have a MITO T-tag (MIcro [Seiki] TOkyo) or MTC. These names really stand for factories, productions schemes, contractors and sub contractors, all to produce an ever increasing number of products within increasignly complex lineup divisions, product-planning and marketing. If Luxman by then had killed its L&G sub-brand and the BIC rebadges were over by 1978, Luxman was nevertheless making mid and low-end separate components for... EUMIG ! Too much to sustain, really, for Luxman, despite having made true bestsellers, still was a very small brand. Even if the following didn't happen in the end, it is nevertheless quite telling of how "small" Luxman was at the peak of its best and most successful years : the french distributor of Luxman envisioned a complete buyout in the late 1970s as its own cash flow was larger than that of Luxman ! By the early 1980s, Luxman was clearly behind the competition even if still making timeless masterpieces such as the L-68A and C-5000a (not to mention tubed amplifiers) and many accessible sonic bonanzas. Alpine was "invited" onboard in late 1983 and the center of decision can be seen shifting from Osaka to Tokyo - gradually but quite rapidly. Alpine built many cassette decks for many brands before launching its own lineups ; Teac for instance benefitted from many Alpine cassette drives for its more common and mid/low end lineups. Just like the Philips buyout of Marantz in 1979/1980, the ALPINE ownership wasn't a full-tilt boogie : Philips only bought 43% of Superscope's entire Marantz assets and the Alpine business was more like a third herald added : Luxman, Alpine/Luxman and LuxKit. Contrarily to what is commonly thought, the Alpine ownership didn't stop Luxman from producing its traditional high-end audio and tube amplifiers : distribution of the latter just got overshadowed by the more steamlined Alpine production. Alpine wasn't a newcomer in the Luxman galaxy of suppliers and was already very present since about 1980, making Luxman's cassette decks and most of its digital prototypes for the upcoming PCM/CD 1983 revolutions. The Alpine direction quickly launched in 1984 the famed LV series (LV-105, D-105 etc) which sold extremely well until the early 1990s (outside Japan). 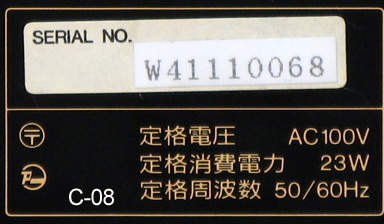 Presented in 1982 and put into production shortly after the Japan Audio Fair, the first batches of M-05 and C-05 still bore "LCJ" next to the T, later ones clearly state "ALPINE". 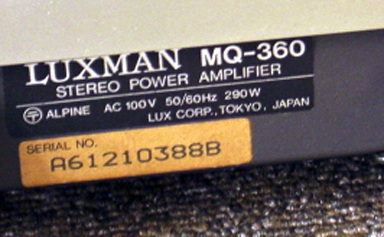 A bit later, 1984, the 360 series (LX-360, MQ-360, CL-360, CL-40, MQ-50), see Luxman leaving Osaka and arriving in Tokyo : either with a sticker added to hide the old tag or, for later batches, with a clean scripting of the ALPINE ownership and Tokyo production place. The common YOSII tag is seen disappearing after the Alpine take-over : L-430 (1982, YOSII), L-550 (1983, YOSII), L-550X & L-560 (1985, Alpine but with the old Lux serial number system), L-570 (1989, Alpine with the new serial number system fronted by an A for Alpine). Even if Luxman's CD players of the 1980s were almost all actually built by Toshiba (starting with the DX-104 and D-03), the ALPINE tag is clearly and simply, visibly, tagged on all Luxman units between late 1984 and 1994 : the "A" fronted serial-number is on all of the Alpine-period Luxman, from the M-03 to the M-06a, D-107u, DP-07, L-570 or D-500X. Under Alpine direction, some healthy simplifications happened like killing the LuxKit brand and its many shortlived side products : the M series for instance or the Rega P3 rebadge. All this was becoming too complex to handle and surely didn't make any money - that is : if the LuxKit Corporation (it was a fully-owned but separate corporation) made any during the 1970s ! However, despite these wise moves, some complex complexifications also concommitantly happened, in maintained Luxman tradition. Some units bore a "Status Series" here but were the "Revolver Series" in Japan or "Laboratory Standard Series" elsewhere - and probably something else elsewhere again. The T-03 tuner was a T-117, sold differently and with different units if in black. Market-related versions kept creeping in into this or that lineup while over-production of some series kept burdening the inventories. 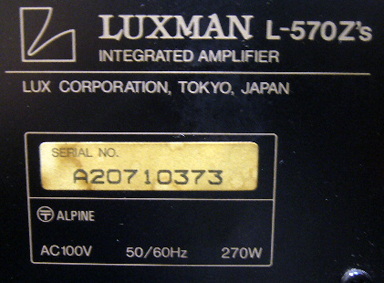 Even if the L-550 series, LV series or the D-500X /X'S and 06 series sold extremely well, the Alpine-oriented Luxman still managed to make ten useless versions out of a single preamp or tuner. When the big Alpine (aka ALPS) backed out of tiny Luxman in 1994, things got... even more complicated. First, a major change happened within the staff : many engineers who were there since the 1970s simply left. The remaining engineers from the "old days" left when another change of ownership happened around 1998 : this is when the "old Luxman" really ended. The SQ-38D and MB-88 anniversary reissues were launched just before that major change..
Pinpointing these changes is clearly visible on the backplates of Luxman components throughout the 1990s. Other contemporary units which were first launched under Alpine direction (D-500X, D-500X'S, E-06, M-06, M-06a, C-06 and C-06a for instance (all with ALPINE tag and "A" serial number) were subsequently produced by AZDEN with only a logo and a "W" fronting the serial numbers. Versions produced after Alpine vanished -the D-500X'SII for instance- have the Azden and "W" scheme while earlier ones (D-500X, 500X'S) still had the Alpine tag. AZDEN produced the overwhelming majority of Luxman's components between 1993 and 1998 ; its logo resemble a P followed by a large dash. AIMOR is a small manufacturer making various untraceable electronic appliances since the 1960s : car-radios, boomboxes, accessories and, now, computer stuff. According to its website, the last update of which is four years old (2005), AIMOR had a total of eight employees in 2005 - small production runs indeed. Other Luxman units of that vintage were built by/at Goto D.S. such as the P-1, C-08, SQ-38U or C-70f. I don't know if Goto D.S. is a factory, a brand or a place, nor do I know if Aimor and Goto are owned by Luxman or mere contractors - or both. Until about 2005, AIMOR-produced Luxmans had the Aimor logo next to the T tag and serial numbers fronted by an "M" ; the non-descript manufacturer (ALPS ?) 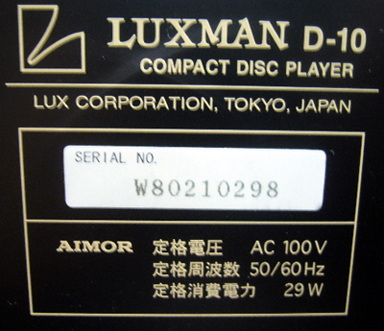 still had Luxman in Tokyo (the Osaka days are gone for sure) and a "W" in front of the serial numbers ; Goto D.S. units had a "G" in front of their serial numbers. Majority ownership seems to have gone from ??? to e-Lux around 2005 ; e-Lux, owned by a Mr Yamada and holding all sorts of businesses not audio-related, recently became Quants and seems to have changed its name/structure again in 2008 (thanks to Mr X for these details). Luxman is however still alive, still with a plethoric lineup, but with limited distribution and seemingly very small production runs. It seems that today's Luxmans are only made by AIMOR and Goto D.S : the preamps at/by Goto, the power amps and CD/DVD sources by AIMOR. Having only two sources represents a big step forward for Luxman toward a practical simplification of its production processes. However, whichever of the two does the actual manufacturing, the current Luxman products have an assortement of "W", "M" (Aimor), "G" (Goto) or "Y" serial number fronts next to their sole Aimor or Goto sources : four suffixes for two sole sources - some things never change ! Above are two of the three versions seen by the Luxman M-05. 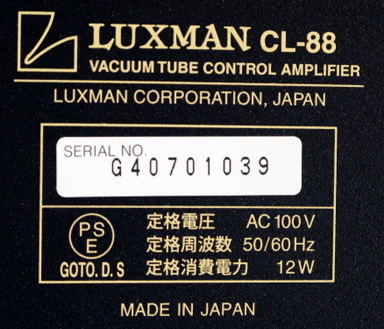 The (brief) first one was tagged with LCJ, Luxman Corporation of Japan, still in Osaka ; Alpine batches first saw Luxman not in Osaka anymore, then, later on, being in Tokyo, Alpine's hometown. LUX batches have "C4401xxx", K3101xxx" or "F4401xxx" serial numbers, all in Osaka ; most ALPINE batches have "A7011xxxx", not in Tokyo yet but not in Osaka anymore ; the rare wood-encased version was from the LUX batches. This is an old TVK page. It will remain online until its new version is ready. This old page may contain errors and approximations. Visit the (beta test) of TVK v2 !